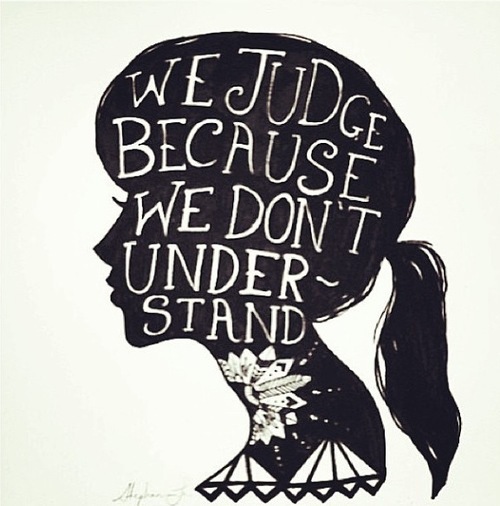 Recently I’ve been thinking a lot about the human inclination towards judging others. I like to think I’ve been brought up to be accepting, but the reality is that as a result of my experiences, education and interactions with others, a million layers of conditioning have permeated and fused with the synapses in my brain, and they are influencing me every day without me being consciously aware. I know this because I occasionally catch myself having a fleeting judgmental thought that doesn’t fit at all with how I view myself as an accepting individual. I am so shocked, in these moments, as I cannot reconcile such thoughts with how I see myself or how I want to be. But, whether I like it or not, those thoughts are a part of me, perhaps not a part I am proud of or happy about, but a part of me nonetheless. Why do we, as a species, so often seek to ridicule – and, in some cases even hate – that which we don’t understand or identify with? What is it that compels us to develop prejudices that serve only to blind us of the very things in our own character that are flawed and need attention? I do not, nor ever could, pertain to know the answer to these questions. But I can’t help feeling that the world would be a better place if someone could. This entry was posted in Real life and tagged acceptance, conditioning, experience, hate, ignorance, judgement, judgemental, judging, matthew 7:1-5, prejudice, religious education by Belle365. Bookmark the permalink.